Argosy has four (4) regularly used facilities and each has differing levels of accessibility to those who may have some limitations. It is our intention to be as straight forward as possible with accessibility of our facilities and vessels in order for you to make the best and most informed decision when choosing where and when to visit us. Please keep in mind that day-to-day operations can change depending on which boat is operating which tour. Please use the below information to assist you with answering your accessibility questions. Or please call our office at (206) 623-1445 or 1 (888) 623-1445, and we would be happy to assist you further. Our crew is trained to help guests with wheelchairs, strollers, scooters, etc. to navigate both our docks, facilities and vessels. 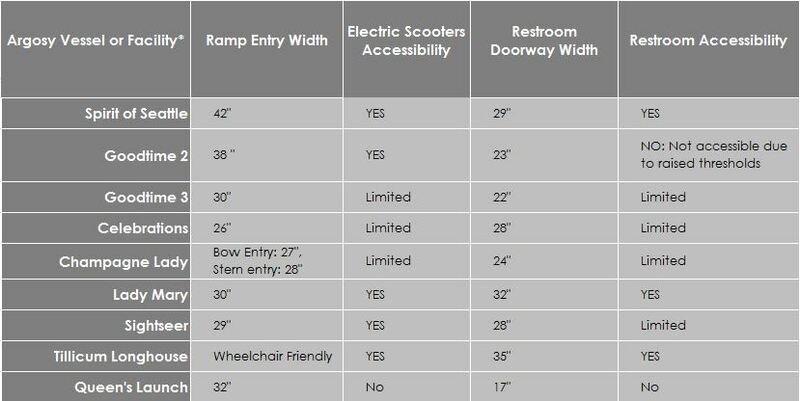 Please be sure to check in with an Argosy Team member prior to boarding if you are in a wheelchair, scooter, or accompanying someone who is. When possible we do our best to pre-board these guests and it is Argosy policy that a trained Argosy employee accompanies every person in a wheelchair during boarding. • Any number of private events. This dock is located on Puget Sound, which means the docks will rise and fall with the tide, changing the angle of our boarding ramps. At low tide, there is a 55-foot long ramp that can have a slope of 20 degrees maximum. Additionally, because this is a floating dock, it is subject to the wakes and waves that occur in the sound, and as a result, it will rock around from time to time with the waves. Generally, we have very few problems when loading passengers of limited mobility on this dock. All of our crew have been trained to assist those who need it, and there are handrails in place (most places) to assist with stability. It is important to note, the Locks Cruise – Boat & Bus tour will always start and end out of Pier 55. However, half the time, this tour begins with a bus ride from Pier 55 to pick up the boat at our AGC Marina facility. It is important to request an ADA accessible bus at the time of making the reservation. This dock is located on Puget Sound which means the docks will rise and fall with the tide, changing the angle of our boarding ramps. At low tide, there is a 65 foot long ramp that can have a slope of 25 degrees maximum. Additionally, because this is a floating dock, it is subject to the wakes and waves that occur in the sound, and as a result, it will rock around from time to time with the waves. There is a parking lot located at the ticket booth and discounted parking vouchers are available upon request (see Parking & Directions). From the ticket booth, it is no more than 150 yards to any of the boats. There are no tides to contend with, so the walk to the boat will be flat and smooth. However, as this is a fixed dock, and lake levels do change throughout the year, there can be a few steps down to certain vessels. These steps will never be more than 9 inches. Guests confined to wheelchairs would find it best to call our office to get details about boarding at AGC. At this location, it is approximately 200 yards from the ticket booth at the top of the dock down to the boat. There are no tides to contend with at the Kirkland City Dock, so the walk to the boat will be flat and smooth. However, as this is a fixed dock, and lake levels do change throughout the year, there can be a few steps down to certain vessels. These steps will never be more than 9 inches. Guests confined to wheelchairs would find it best to call our office to get details about boarding at Kirkland City Dock. The Tillicum Longhouse is located on Blake Island. The dock on the island is also subject to the tides of Puget Sound. Again, during a low tide, the ramp could have a slope of 20 degrees leading to and from the island. Once on to the Island, there is a clam shell path that will lead up from the shore to the longhouse. Crew will be available to assist guests from the boat to the longhouse if needed. Once inside the longhouse, guests will find an accessible building. Guests requiring accommodations may request priority seating at the time of reservation for the dining room. Assistance moving through the food buffet may be requested at any time. STROLLER RECOMMENDATIONS Our Tillicum longhouse is reached via an authentic clamshell path, and Blake Island itself is a state park. As such, it has a network of unpaved trails and rocky beaches to explore. If this is of interest to you, and you are bringing a stroller, we recommend using an all terrain stroller. If you have further questions, please call our office at (206) 623-1445 or 1 (888) 623-1445 and we will be happy to assist you further. *All boats used for our Public Cruises, Tillicum Excursion and Special Events are subject to change. Please call Argosy at (206) 623-1445 or 1 (888) 623-1445 to confirm the boat used for your event date. We will always have staff assist anyone with mobility needs.